Bicycle is a vehicle that can reach a very high speed, can carry heavy loads, using only the power of the rider, without pollution and healthful for rider. Bicycle is still very popular despite the two-wheeled motor vehicles and four wheeled are already very popular. Bicycles can be easily modified for various purposes. Bicycles are now evolving with advanced technology. Weight of the bicycle can be reduced to less than 8 kg, even there is a claim that succeeded to fabricate a bicycle weighing under 6 kg. Mechanical Effeciency is also increased, claimed to reach 99%, this means the pedal power of 100 watts of regular riders (not racers), 99 watts is transformed into a bicycle motion. The world record for the highest speed currently has reached more than 130 kmh by using very good aerodynamic devices. Imagine if yourself ride a bicycle with speed 130 kmh or about 81 mph, high speed with your own power from both your thighs. More detail about fastest speed on bicycle, please read here. 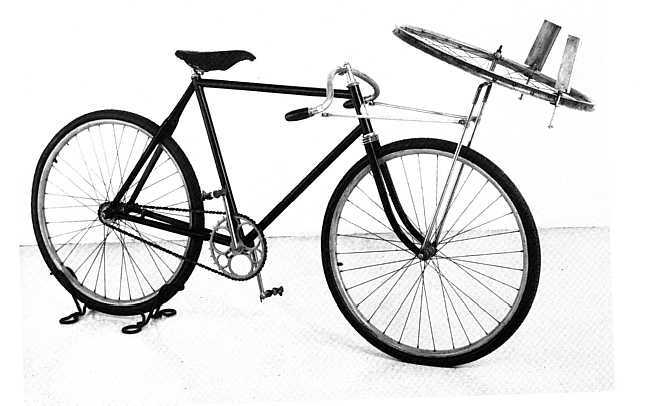 Bicycles have the basic components in mechanical engineering such as gears, chains, brakes, one-way clutch, etc.. According to the guide book of mechanical engineering, machinery main components include: screw, spring, bearing, shaft, gear, chain, coupling and brake, which are all contained on a bicycle. Many of the components used in the two-wheeled motor vehicles and four wheeled were originally developed on a bicycle. For example: pneumatic tires, steel wire control (brake wire), chain and sprocket transmission, differential (on tricycle), disc brakes, etc.. This can happen because of the development and testing on the bicycle is not too expensive, and a bicycle capable of running at high enough speed so it is suitable for testing at high speeds. I myself have developed a simple Pico class wind turbine by using bicycle wheel components. Even the bicycle has transmission speeds up to 30 level where almost no other vehicle, or other machine, which can rival. 30 levels obtained with a combination of speed gear (sprocket) 3 pieces front and rear sprocket 10 pieces, so they can get a 3 x 10= 30 combinations or levels of speed. Theoretically, to implement a bicycle component on to motor vehicles, design engineer simply raise its power factor, in other words it only needs to raise component strength and or make it bigger. Wright brothers in the year 1901 were applying theis knowledge and expertise as bicycle manufacturer to fly and control a large kite. They adopted steel wire control system from bicycle to steer that large kite. Furthermore the kite was modified and designed in order to ‘float’ a pilot and a motor, which was then known by us as aircraft. Shown above is a bicycle that was used for aeronautical experiment to find pitch angle. Therefore, for those who want to study the field of mechanical engineering, I strongly recommend to start learning from the bike. Bicycles are also have very affordable price.